When visiting Lisbon, Portugal it would be impossible not to notice the numerous churches in the Old Town. It seems like every time we turn a corner, we see yet another church. If the church doors happen to be open, we are certainly going to step inside to take a look around. Steeped in history and ornate in style, Lisbon churches are fascinating – and they are all free to pop inside for a quick visit. We’ve been the sole visitors in enormous churches, our echoing footsteps the only sound – and we’ve walked into smaller, lesser-known churches where every pew is filled for evening mass. When we visited at Christmastime, festive decorations adorned the churches, nativity scenes were prominently displayed, and music filled the historic churches at classic holiday Lisbon concerts. 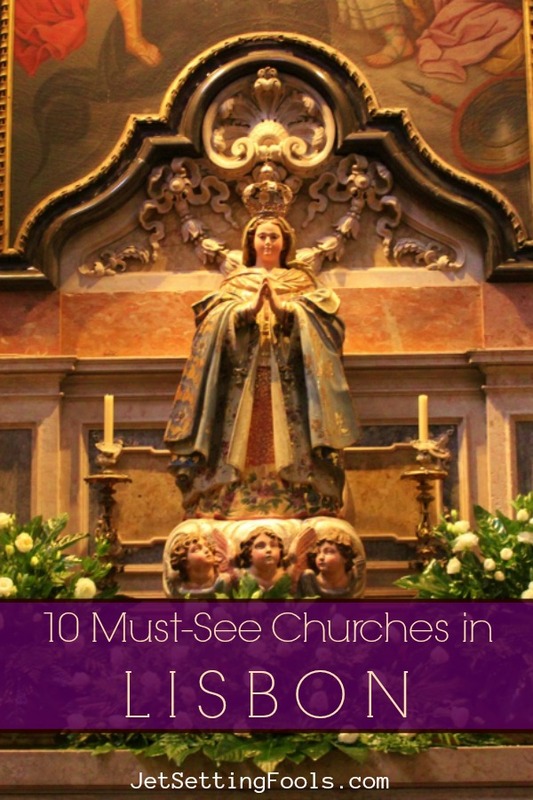 Our list of the top 10 Churches in Lisbon, Portugal are based on our own opinions. We have included a helpful link to Google Maps for each church, as well as a Lisbon map of all the recommended churches at the end of the post. One of the most impressive churches in Lisbon – and seldom visited by tourists – Basilica da Estrela has striking features and a lamentable story. Sitting on a hill, the church dome can be seen from afar and, up close, the double bell towers rise from the ornate façade. Officially called the Basilica of the Sacred Heart of Jesus, the church was the first church ever to be dedicated to the Sacred Heart. Queen Maria I of Portugal had the church built in gratitude for bearing a son, Jose, who would ascend to the throne. Construction of Estrela Basilica lasted from 1779 until 1790…which was two years after Jose died from smallpox. Queen Maria I died in 1816 and is buried at Estrela Basilica (find her tomb in the right transept). Key features of the church include the distinct marble used in the interior (grey, pink and yellow arranged in geometric designs) and the elaborate nativity scene comprising more than 500 figurines. For a small fee, visitors can climb to the domed rooftop for fantastic views. Estrela Basilica is located in Lapa, Lisbon on the west side of the city; Map. The stoic exterior of Santa Catarina Church does little to encourage passersby to step inside, but those who do are rewarded with a phenomenal sight. The Baroque church’s gilded interior shimmers in golden hues. Extensive ornamentation and intricate details decorate the altar, organ and ceiling. The first Church of St. Catherine was built on the site in the 16th century, but it was destroyed (and rebuilt and destroyed) by the 1755 earthquake and fires. Today, the church is listed as a National Monument. Top Tip: The church façade is difficult to view on the narrow street; take a few steps down Condessa do Rio for a partial view of the church. Igreja de Santa Catarina is located in the Bairro Alto district; Map. Sao Roque Church is another Lisbon church with a deceivingly bland façade concealing an absolute gem. Plain on the outside, but glittering on the inside, touring the Portuguese church is a must-do in Lisbon! Of particular interest is the Chapel of St. John the Baptist, which is considered to a be a masterpiece of European art. Next to the Igreja Sao Roque is an adjoining museum that features religious artifacts and information. Origins of Igreja de Sao Roque date to the early 16th century when Lisbon was suffering from a plague outbreak. A shrine was established to house a holy relic of St. Roch, the patron saint of plague victims, on the site of the plague cemetery. When the Jesuits arrived in Portugal in the mid-1500s, they selected the shrine as the site of their new church (one of first Jesuit churches in the world). Insisting on a simple exterior, the Jesuits lavishly decorated the interior in the Baroque style with colorful statues, tiles, woodworks and paintings. The Church of Sao Roque miraculously survived the 1755 earthquake. Four years later, however, the Jesuits were expelled from the country and the Lisbon Holy House of Mercy took ownership of the church (which it retains to this day). Sao Roque Portugal is located in the Bairro Alto district; Map. The parish chapel of Our Lady of the Martyrs was built in 1147 to commemorate the soldiers who died defending the Christian faith in the Siege of Lisbon during the Reconquista. Destroyed in the 1755 earthquake, the Basilica of Our Lady of the Martyrs was rebuilt in the Baroque style in 1784. The most stunning feature is the frescoes in the ceiling that depict the victorious battle against the Moors in 1147. Unlike other Lisbon churches, green is the dominate color in the ornate (yet somehow understated) church. The Basilica dos Martires is located in the Chiado district; Map. Perhaps the most intriguing Lisbon old town church, Santo Domingo has a storied past and scarred remains. Built in 1241, the church was the site of royal religious celebrations, like weddings and christenings. However, Sao Domingos also hosted darker occasions, such as the Lisbon Massacre and execution of a Jesuit missionary. Through the years, nature has taken a toll on Santo Domingo. The church was heavily damaged by the 1531 earthquake, completely ruined in the 1755 earthquake and ravaged by fire in 1959. The gutted church was renovated and reopened in 1994. Uncharacteristic of most restorations, the church still bears witness to the fire and the smell of soot lingers in the air. The damaged interior is both eerily haunting and astoundingly beautiful. Santo Domingo Church is located in the Baixa district; Map. Nearly blending into the flanking buildings, Our Lady of the Conception is recognizable from the street for its main feature: the ornate Manueline portal. The elaborately decorated double-arched doorway, which survived the 1755 earthquake, welcomes visitors into a single-nave, 3-story interior. Inside, eyes are naturally drawn to the brightly-lit altar and presbytery residing beneath a rising Roman arch. Overhead, the vaulted ceiling is painted with a portrayal of The Triumph of Our Lady of the Conception, which shows God blessing the Virgin Mary while an angel kills a dragon. The history of Nossa Senhora da Conceicao Velha is a bit complicated. Ownership has changed hands multiple times since it was founded in 1498. Reconstruction and upkeep have been a constant for the church. The historic church reigns as one of the few remaining buildings designed in the Manueline style (Portuguese Late Gothic). Nossa Senhora da Conceicao Velha is in Old City Lisbon; Map. Built for the bishop on the site of a former mosque in 1147 (after the Siege of Lisbon victory), the Se Cathedral Lisbon is one of the most famous churches in Portugal and the oldest in the city. Classified a National Monument in 1910, the church has seen significant changes through the centuries. Designed (and renovated) using various architectural styles – including Romanesque, Gothic and Baroque – Se Lisbon Cathedral resembles an imposing fortress. The Cathedral Se Lisbon lacks an expansive fronting square (instead, tram tracks lead straight to the front door and veer to the left around the buildings). Wedged into a small space, it’s difficult to appreciate the size of the church. The best view of the church is from the nearby tram stop, where there is a better vantage point of the twin bell towers and slightly-off-center Rose Window. The dark interior of the Cathedral is rather plain in comparison to other Lisbon churches. Although a bit bleak, the highlights are the altar and artwork. For a small fee, visitors are allowed to enter the cloister and treasury. In the adjacent cloister, excavated ruins of Roman, Arabic and Medieval civilizations are displayed. The church treasury is located inside the church and displays robes, jewels and other important relics. Lisbon Cathedral Mass Times are at 11:30am and 7:00pm on Sunday and at 6:30pm on Tuesday and Saturday. The Se Cathedral is located in Alfama Lisbon; Map. Built in the mid-1700s, Igreja de Santo Antonio de Lisboa is dedicated to the city’s patron saint, St. Anthony of Padua. The church, which sits in the shadow of the Lisbon Cathedral, marks the site where Saint Anthony was born in 1195. In fact, St. Anthony was baptized in the Se Cathedral; the baptismal font used in his baptism is still displayed in the Cathedral (first chapel on the left). The small Baroque-style Santo Antonio Church features the life and work of St. Anthony depicted by statues and paintings. An underground chapel marks the exact spot where he was born. Outside, visitors lob coins at a statue of St. Anthony in an attempt to land one on his book. Those successful are said to be lucky in love (because St. Anthony is also the Patron Saint of Lovers). The Saint Anthony Church is located in the Alfama district; Map. Opening onto one of our favorite Lisbon viewpoints, the hilltop Graca Church ranks as one of the oldest churches in the city. Built in the 13th-century (and rebuilt in the Baroque style after the 1755 earthquake), the church features a double façade and bell tower. The attached convent, which was the head of Portugal’s Order of Saint Augustine from 1291 until 1834, has been converted into military barracks. The Graca Church, which is a National Monument, features a collection of historic tiles and artwork. Tucked into the corner is the Senhor dos Passos sculpture. During Lent, the sculpture is paraded through the city streets from Sao Roque back to Igreja da Graca – a tradition that began in 1587. The Graca Church is located in the Graca neighborhood; Map. Established in 1147 as a monastery for the Augustinian Order, the Sao Vicente de Fora Church was built between 1582 and 1629 in the Mannerist style. The St. Vincent Church features two soaring towers and a façade of arches and statues. Inside, an ornamental canopy sits over the altar that is flanked by enormous statues. The massive organ is featured beyond the altar. The accompanying Sao Vicente de Fora museum displays a large collection of artworks, including paintings, sculptures and artifacts. The most impressive exhibits are the displays of Azulejo Tiles. Museum visitors are also allowed access to the rooftop, which provides stunning views of the city. Sao Vicente de Fora is in the Alfama District; Map. 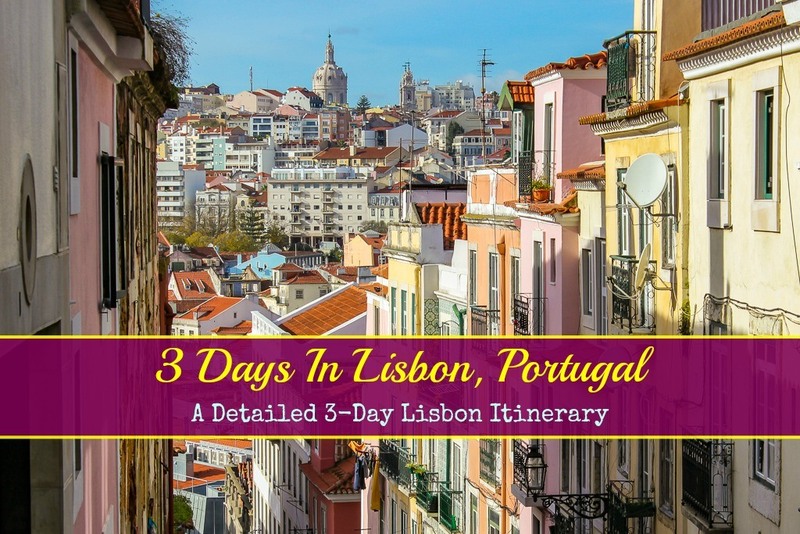 Use this link to Google Maps for a Self-Guided 3.5-mile Lisbon Churches Walking Tour. 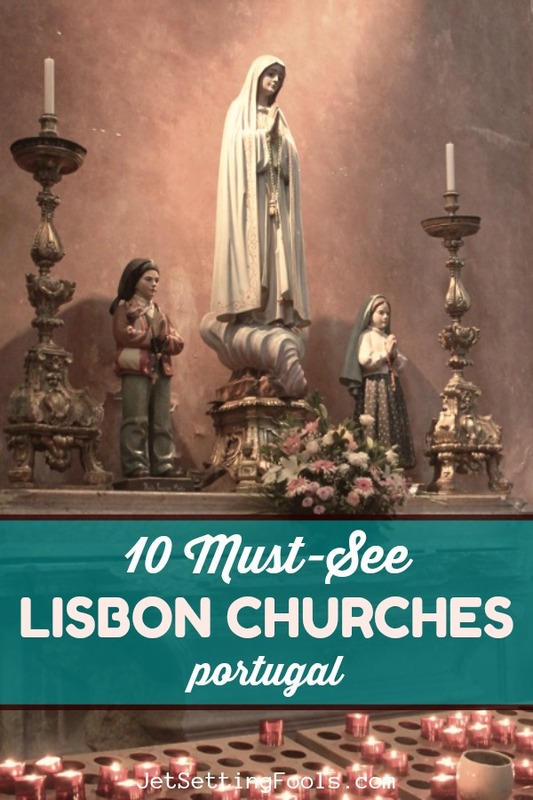 Listed above are our 10 favorite Lisbon, Portugal churches, but there are plenty more to see! Here are a few more unique churches to add to your list. Officially Igreja de Nossa Senhora do Rosario de Fatima, the Fatima Church in Lisbon is a modern, art deco church that contrasts sharply with the many 18th-century Baroque churches in the city. Built in 1889 for the British Anglican population, St. George Church in Lisbon has an adjoining cemetery with 31 Commonwealth War Graves. The Jeronimos Monastery in Belem is the best-preserved example of Manueline architecture. Designated a UNESCO World Heritage Site, the monastery is one of the top attractions in Belem. Read about the Top Things To Do in Belem. Most of the churches in Lisbon, Portugal are Catholic; Catholicism is the main religion in Portugal. Although a few buildings have been transformed into Lisbon monuments, most of the churches still hold masses and host other religious functions. Be mindful to dress appropriately, remove hats, keep voices low and be respectful during masses. Some of the churches allow photography, but check before you start taking pictures (there should be a sign at the door). Although the churches in Lisbon are spectacular, there is a lot more to see and do in the city! 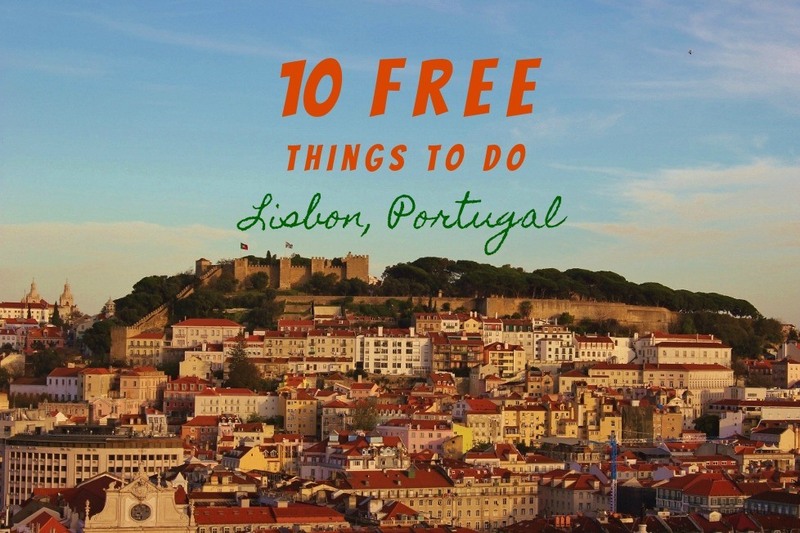 Use our guide of 10 Free Things To Do in Lisbon to find out what other great sights there are to see! During our trips to Lisbon, we have stayed in Airbnb apartments in Alfama (the east side of the city) and Lapa (the west side of the city). We have also stayed in the posh Altis Hotel and Spa in Belem. 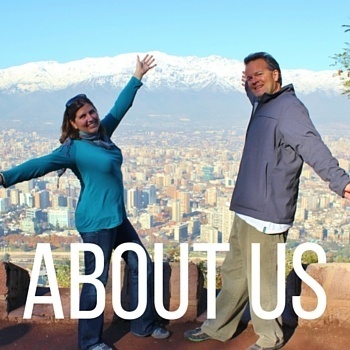 We usually prefer apartments – for the extra space and kitchen – but loved our stay at Altis! However, Altis is located in Belem. Travelers who would rather stay in the city center have many options for Lisbon hotels. Check out these top-rated hotels (based on guest reviews!) for your upcoming trip: TURIM Marques Hotel, My Story Hotel Rossio, Portugal Boutique Hotel. On a budget? Check out these popular Lisbon Hostels: Hostel 15, The Dorm, or New Lisbon Concept Hostel. If you are looking for a Lisbon Hotel or Hostel, start your search on Booking.com – like we do! Wondering what to eat in Lisbon? Get the ultimate Lisbon food guide, Lisbon in 100 Bites. Lightweight and comfortable walking shoes are a necessity in Lisbon! I (Sarah) have traveled with these shoes by Columbia and Skechers. Kris prefers wearing these shoes by Merrell. 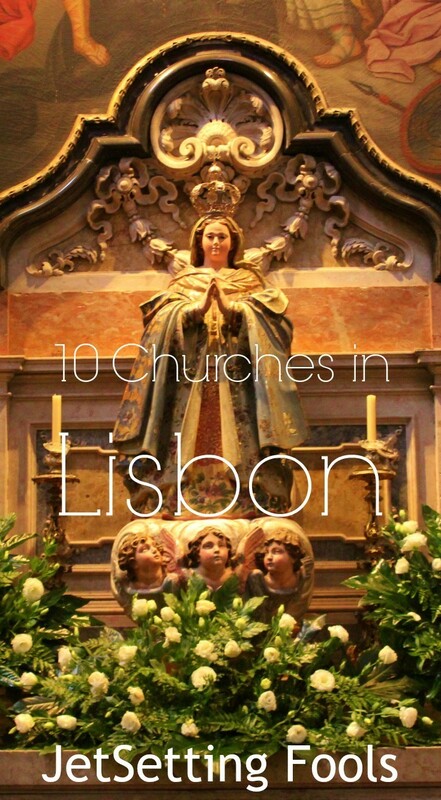 We want to know: What are your favorite Lisbon Churches? 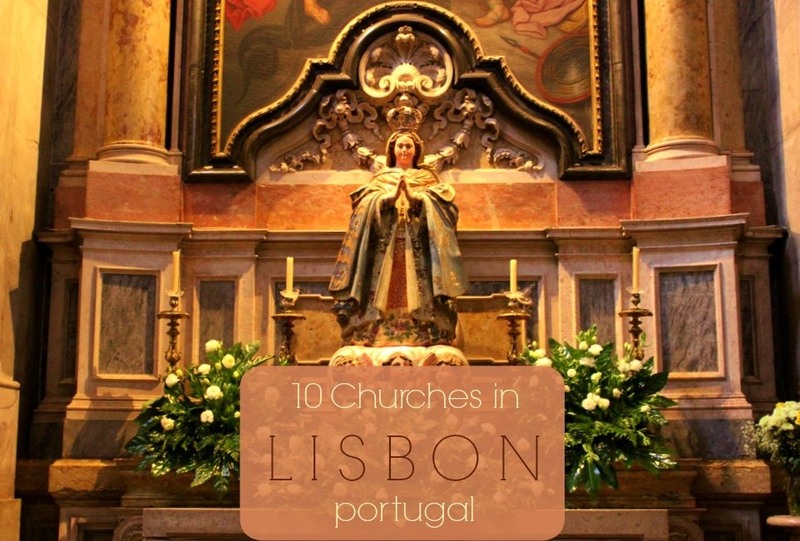 Are there any that we should add to our list of Must-See Churches in Lisbon? 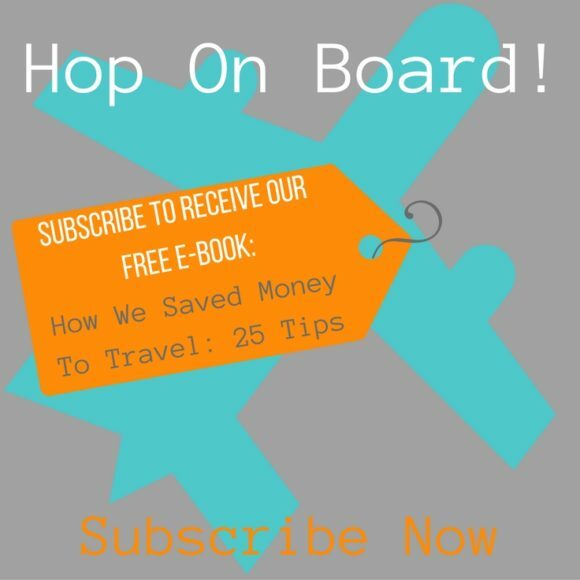 Give us your best tips and advice in the comments below! Number 8 is São Nicolau, not São Miguel. Oh no- You’re right! I mixed up my photo folders. Thanks for letting me know – I’ve changed the photo to the one of Sao Miguel. Cheers! Thank you for the church tour. What religion do you follow if any? Loved the nativity scene in #4 & Lisbon Cathedral exterior resembles Notre Dame in Paris. Hope the holidays aren’t as commercial as they are here. Merry Christmas! Hi Cindy ~ I am Catholic and I love old, European churches. The churches in Lisbon are so beautiful ~ we said the same thing about the Lisbon Cathedral being similar to Notre Dame. It’s difficult to tell how commercial the holidays are here, since we are slightly isolated (we don’t watch TV, language barrier, not a big group of friends to ask). But, my impression is that it’s a mix. There are Santa decorations, but also baby Jesus banners. There is shopping for presents, but the present giving (at least in Lisbon) doesn’t happen until January 6, keeping Christmas (possibly) a little more about religion. Both church concerts we attended were in enormous churches and were standing room only. We’ll be in Barcelona for Christmas, so it might be different there. 🙂 Merry Christmas! Merry Christmas to you, too, Sam! Miss ya! Beautiful cathedral & basilica church interiors! Thanks for this special Christmad greeting! Thanks for this Christmas greeting! Merry Christmas! 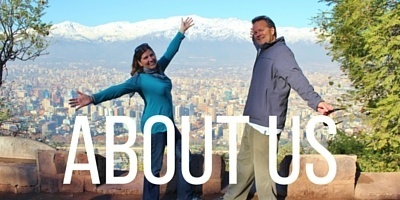 Visiting the many churches and concerts helped get us in the Christmas spirit! They are so beautiful ~ and we loved the Nativity scenes!